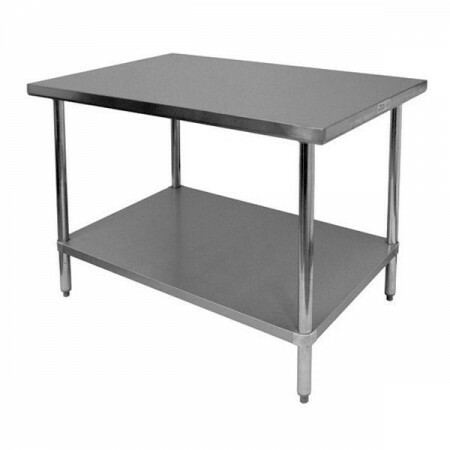 Thunder Group SLWT43036F Flat Top Worktable 30" x 36" x 35"
TigerChef > Restaurant Equipment > Work Tables > Commercial Stainless Steel Work Tables >< Stainless Steel Work Tables > Thunder Group SLWT43036F Flat Top Worktable 30" x 36" x 35"
✔ Flat top✔ Adjustable undershelf and legs✔ 1" adjustable plastic bullet feet✔ Dimensions: 30" x 36" x 35"
Add essential work space and storage in your kitchen with the Thunder Group SLWT43036F Flat Top Worktable 30" x 36" x 35". Designed with an undershelf, this worktable allows you to store flour, sugar, and more to keep your cooking supplies organized and easily accessible. Thanks to its flat top, this piece also provides a sanitary and easy-to-clean surface for preparing sides, desserts, and more. Combining convenience and exceptional durability, this worktable has adjustable legs and bullet feet for stability and is made from rust-resistant stainless steel. Dimensions: 30" x 36" x 35"
Do you have a under shelf to fit this table? This table comes with a galvanized steel adjustable undershelf.